WILLIAMSBURG — Supporters of a Williamsburg after-school and summer camp center were all smiles Tuesday night after Community Board 1 voted unanimously to support the construction of a new four-story building to house their services. School Settlement Association and St. Nick's Alliance have been trying to get city approval to demolish their current, more than 100-year-old building at 120 Jackson St. to build a new, $18 million community center. It would feature a computer lab, classrooms, an auditorium and a gymnasium, which many area schools lack. The current building, though not landmarked, was featured in Betty Smith's famous book "A Tree Grows in Brooklyn." The history of the building and potential construction and parking issues drove a couple area residents to speak up against the project. "We talked about preserving the neighborhood," said Phil Montana, who's been vocal about his opposition. "Building this monster building is not preserving the neighborhood." But supporters of the project far outnumbered those opposed at the meeting, filling the community room at the Swinging '60s Senior Center on Ainsle Street with children, adults and colorful posters. "They are talking about expanding a resource that is the only affordable option for a lot of people in this neighborhood that gives our kids a chance to have after-school care," said Lisa Rapaport, a mother who lives near the building. Ultimately, the community board voted to approve the project on the condition that a construction task force regularly meets with residents and that a prominent exhibit documents the history of the century-old building. Land use committee chair Del Teague said the board wanted to "balance the needs of expanding services with the concerns of the residents" in granting its support. The board's vote is advisory for the final vote by city's Board of Standards and Appeals, which would allow for the proper zoning variance and should happen within the next several months. 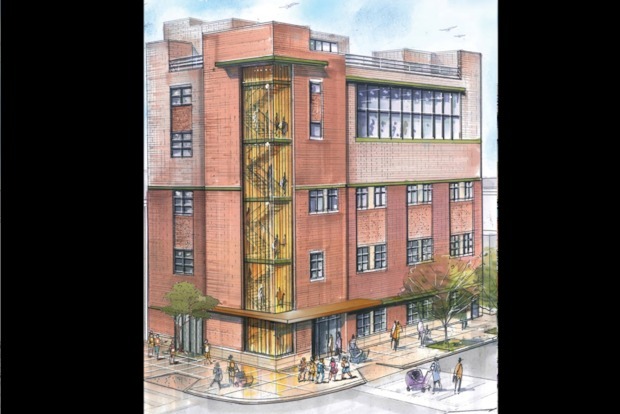 School Settlement Association has been seeking to expand its building since 2008, said St. Nick's spokesman Greg Hanlon. It has raised about half of the $18 million and hopes to start construction as soon as possible, he said.